We were truly impressed with how well the project was organized and executed. It is clear that Search and Rescue has come a very long way, built upon a long history and utilizing the latest technologies today as well. Even before we had arrived, the team had developed a complex plan, and constantly adjusted with new information. The coordination between the people in the field, the operations center, and our family was flawless. We all recognize that this was a miracle from God, but clearly, a miracle assisted by his good people. On behalf of the Kim and An families, I would like to sincerely thank the entire collaborative team involved in the tremendous effort to save my father. Through selfless, extraordinary acts, the search and rescue teams beat incredible odds to successfully find my lost father. area was amazing! Just knowing that these people cared, giving up so much for my father touched all of our family and friends throughout the entire ordeal. Lastly, sincere thanks to our family, friends, and church for their thoughts, prayers, and support from the beginning. A terrible situation that could have ended in tragedy, instead turned into another beautiful example of how Americans come together to help each other. Not for monetary gain or other selfish reasons, but because as a community, we care about each other. In the end, God works in mysterious ways and we would like to especially thank our Lord, God for good people, his grace, and the love that ended up saving my father today. A seasoned mountaineer, who was lost for two days in a snowstorm on a mountainside, told rescuers he survived by burning dollar bills and dreaming of a sauna. Yong Chun Kim, 66, started a fire and first burned leaves - before resorting to the contents of his wallet and his socks. Tough terrain: Yong Chun Kim, 66, survived two days and nights on Mount Rainier in Washington by burning money and then his socks. Mr. Kim, who served in the South Korean military in the Vietnam War, told local station KOMO-TV that he had fire starters with him and first burned some leaves before turning to personal items. He was rescued yesterday but was in such good shape that there was no need for him to go to hospital. 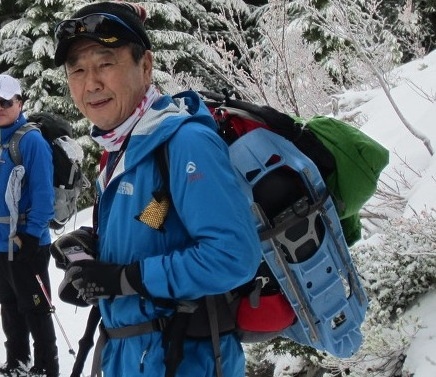 An emergency team discovered Mr. Kim in deep snow in a river valley after snowshoeing to find him. It took nine hours to bring him down from the remote spot because of the treacherous conditions. Rescue service spokeswoman Lee Taylor told the News Tribune newspaper that Mr. Kim was an experienced hiker, and had been alert, conscious and stable when he was found by the team of three. Mr. Kim was reported missing on Saturday after he fell down a slope and became separated from his group in the highly-elevated Paradise region. The group continued to navigate back to the Trail Head, but Mr. Kim did not meet them there. 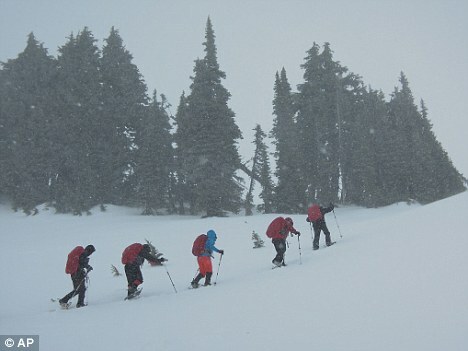 Little visibility: Five members of a snowshoe group led by Kim in the early hours of an outing at Mount Rainier National Park. (Note the Essential winter day packs and ski poles). Snowshoe enthusiasts use specialized footgear that allows them to spread their weight over a larger area, which keeps them from sinking into deep snow. It makes it possible to hike across huge drifts that would otherwise be inaccessible. Mr. Kim, who has been snowshoeing for a decade, was well-equipped for a day trip but didn't have overnight gear. The 66-year-old was the leader of his group meaning the other less experienced members weren't able to accurately describe where he had slipped. Mount Rainier has seen temperatures in the teens (minus 9 Celsius), and eight inches of new snow fell in some places over the weekend. Wind-blown snow drifts were as high as 30 inches in some areas. Bad weather prevented a helicopter rescue, so crews used a Sno-Cat snow vehicle to reach the area where Mr. Kim was. His son Malcom An thanked rescuers. Three weeks after Mount Rainier’s epic snow storm of January 14-22, personal testimonies from the survivors – principally Josephine Johnson and Jim Dickman, two snow shoers serendipitously rescued as part of the search for a third snow shoer, Yong Chun Kim – are co-mingling with facts from park officials to deliver a clearer picture of what happened during a storm that has left four climbers still missing on the Mountain. For the full detailed account please click our link to the blog The Mountain News - WA "Serving those who live close to Mount Rainier in body or spirit", for a detailed description and lay analysis of the events leading up to the rescue of three snowshoe hikers and the loss of four climbers and campers in the forecast strong storm that overtook many on a fateful mid-winter weekend in January 2012. What can be learned from this tragic incident? We have been unable to talk to Yon Chung Kim. Federal HIPPA privacy laws prevent medical personnel, including SAR Units, from providing contact information for patients. If Mr. Kim will contact us, we will correct any inaccuracies in our analysis. This is not a 'could-a, would-a, should-a exercise, but a traditional effort to help others learn valuable lessons from the experiences of others. We note from the photos of Mr. Kim and his companions, that they carried good winter sized day packs (with the Ten Essential Systems). Mr. Kim was able to overnight, with his skills learned in South Korea and the regular gear he carried snowshoeing on Mt. Rainier with his winter day pack. We think he did not have a small stove to melt essential drinking water. We do not know the temperature on Mt. Rainier for those two days and if melt-water was available. Perhaps he was able to get water from the river. Cell phones have increasing coverage, year by year. (Check your favorite areas). Most of the urban facing slopes of Mt. Rainier are covered by cell phone towers signals. We do not know if Mr. Kim and his companions had cell phones or coverage. We do know that a SPOT-2 was not activated. We do not know whether a Responsible Person had or had not agreed on a time to call 911 if the backcountry travelers had not returned. We believe that a cell phone was used to call Rainier SAR by his group from the parking lot.. Consider whether Mr. Kim, as a Leader, would benefit from a $149.00 SPOT-2 GPS Satellite Messenger. This new device will send a message home, "I'm OK and having fun exactly here on this map"; or message friends "I could use a little help, exactly here"; or send a message to 911 "I need help exactly here, right now - see the map attached," (taking the Search out of Search and Rescue)! Navigation back to camp or car with a map and compass and optional GPS . Mr. Kim slid down a steep slope and it was not judged feasible to climb back up to his group. Reportedly, he directed them to return to the Trail Head and planned to meet them there. Reportedly, however, Mr. Kim became overwhelmed by deep un-consolidated snow in a river valley in the storm and was unable to make his way back to the Trail Head. Reportedly, it took nine hours to reach the trail head with the rescue team members. Did he have a USGS Topo Map and a declination adjusted base plate compass? Did Mr. Kim have a GPS? (Note that it is not necessary to leave a $100.00 GPS on all the time! Most GPS receivers have at least 14 hours of life on two new batteries. Extra AA batteries can be carried in a warm pants pocket to change out batteries weakened by cold. Lithium batteries withstand the cold much better than "regular" AA batteries). It is not necessary or even a good plan, to "track back": Using a $7.00 USGS topo map and a $30.00 base plate declination-adjusted compass, it is simple to draw a line back to camp (where you have surely input a waypoint). Then find on the map, the best way back to camp, (by the nearby road system, etc.) Leaving your simple $100.00 Garmin eTrex H GPS "on" so you can "track back" is not recommended and very inefficient. If you do not need to save a "Track", leave your GPS in a pants pocket, shut off until needed. Learn to use your topo map, adjusted base plate compass and adjusted GPS together, when needed! "By reporting over and over what went wrong in these cases, we learn what to avoid. If you read about avalanche accidents, you'll see that about 80% of the accidents are caused by about the same five mistakes. There are similar 'what went wrong' reporting's of Kayak accidents. If you are a kayaker who takes on more than Elk Lake, its helps to know the three or four elements that appear common to most incidents. It's called learning from the mistakes of others and it doesn't happen unless those mistakes are pointed out." Visitors are reminded to tell a Responsible Person where they are going, where they plan to park, when they will be back and to make sure that person understands that they are relied upon to call 911 at a certain time if the backcountry traveler has not returned. Carry a simple cell phone and/or a SPOT-2 Satellite Communicator to call for help when the problem first appears. If you become lost or stranded, mark your location and stay still or move around your marked location to stay warm. Do not try to find your way until you are exhausted, or worse yet - wet. Wait for rescuers.